Peel the onion and galic. Chop tomato finely. In a kadai put one teaspoon of oil and fry separately red chillies, coriander seeds, pepper, jeera, fenugreek seeds, khus khus and ginger. Cool and grind it to a fine paste. In a thick bottomed kadai, put the oil and when it is hot add mustard. When it pops up add urad dhal and fry till it become light brown. Add asafotida powder, curry leaves, onion and garlic flakes and fry for a while. Then add chopped tomato, turmeric power, salt and fry till it mashes well. Then add the ground paste and mix well. Add required water and make it semi liquid. Close with lid and bring to boil. When it starts boiling, add tamarind water and stir well. Allow to boil till it is slightly thick. Tip: You can use any oil for this kuzhambu. However if you use gingelly oil, it enhances the flavor of this Kuzhambu. 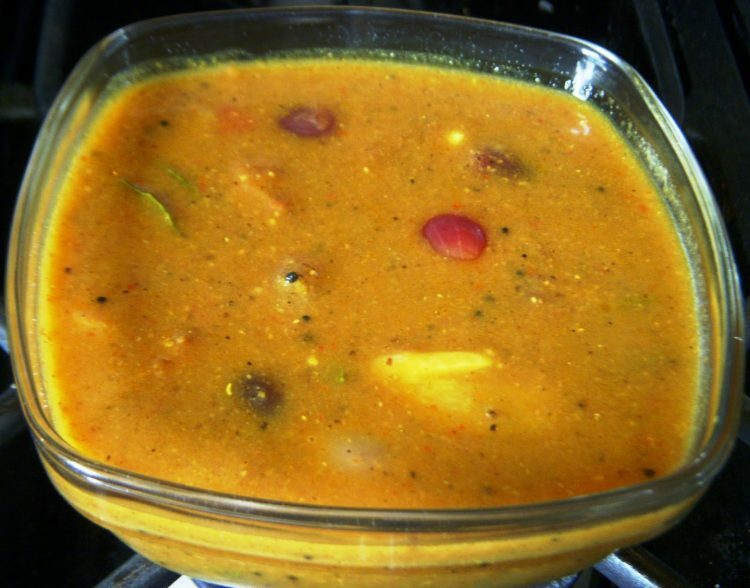 hi, I tried your Kara Kuzhambu and we simply loved it.. Thanks for sharing the recipe with us. I love your recipes. Simply awesome. I couldn’t get the consistency you have in this curry. Any tips on how to get it thick? The reason may be you have added more water than required. You have to make thick tamarind juice. Actually when you add the masala paste, kuzhambu will become very thick. If you allow to boil for few more minutes, then you will get the right consistency. Thank you for visiting my blog. It is a good idea to add ingredients in powder form. Yes. You can add little coconut too. I have not included in this recipe because, I have added "Khus Khus". Your kuzhambu varieties are the best!!! !Thanks a lot!!!!! Thnks for this gravy. My daughter prefers such gravies she use to ask me to prepare different types of gravies. I think this will be a good one for her.We expect u to come out with some more varieties of dishes. One more thing can give recipe for “Moor Appam” and kothamalli Podi. Thank you for visiting my site. I have already posted Kothamalli thokku (it is more or less like Kothamalli Podi). I will post the recipes asked by you soon. Thank you Archana for your kind comments. will u please add some more kulambu varieties in this site…….. I Have already posted some varieties of Kuzhambu in my site. Check under the category “Kuzhambu”. Thank you Lalitha for your kind words. Thanks for the awesome recipe. Kindly let me know when and how to add coconut. Also can I leave out khus khus? Thankyou for another lovely recipe. I made it today, and my daughter loved it so much that she can’t wait for dinner. My accompaniments were cluster beans and a non-veg dish. Thank you for your feed back Tasneem. Yes Cluster beans curry go well with this. It is an information for me that non-veg dish also goes with this kuzhambu. Thank you Priya for your kind words.